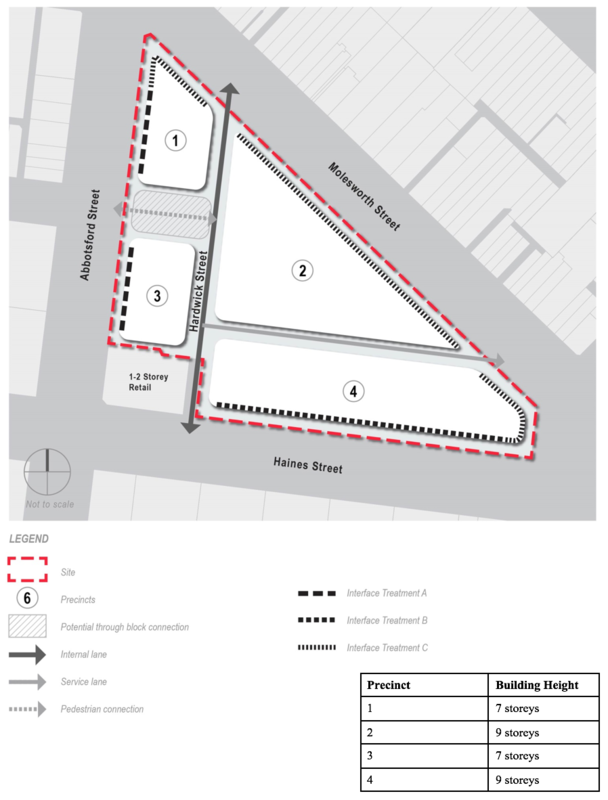 The Planning Minister Richard Wynne has approved amendment C306 to the Melbourne Planning Scheme, the renewal of the Abbotsford St public housing precinct, on 29 March 2018. The current precinct has 114 public housing units in generously spaced buildings across 18,000sqm of land. The original proposal for renewal was to increase the number of units to 123 (though with a net reduction in capacity due to more single bedroom units replacing larger units), convert these to social housing as opposed to public housing, and allow the sale of land and development of an additional number of private units at a quantum that provides the incentive to a developer to complete the entire precinct. The program is therefore underpinned by the sale of public land to private ownership, and the conversion of public housing to social housing. Our Greens Councillors and State and Federal local MPs have been highly critical of this model: what happens when the new buildings come to the end of their useful life, and there is no more public land to sell? And without public investment in public housing, the opportunity to provide a significant increase in public housing capacity (as opposed to the 10% increase in units which will see a real reduction in capacity) has been well and truly squandered. Where there is agreement is that the current housing stock is not fit for purpose. The good news with the Minister’s announcement is that the State Government has agreed with the City of Melbourne’s concerns on two critical issues: land has been put aside for education purposes, and the modelling for site capacity and context has been taken into account resulting in a more nuanced development plan. Provision has also been made to identify preferred locations for open space, to ensure appropriate connectivity through the site, and to require the retention of a greater number of mature trees. The interface treatments refer to the setback requirements for upper levels. Treatment A requires no setbacks (e.g. 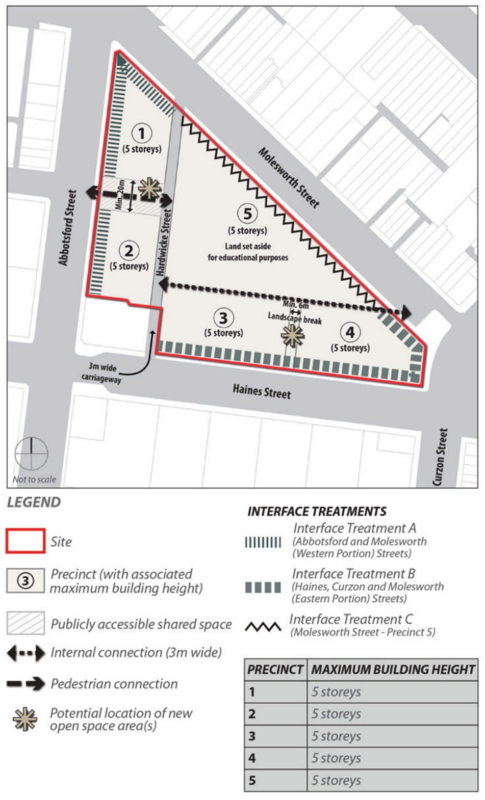 five storeys street wall height along Abbotsford St), treatment B requires the fifth storey to be setback 6 metres, and treatment C requires the fourth and fifth storeys to be setback 10m, this being the most sensitive interface with a stable residential area not on the main street. The buildings won’t take up the entirety of the five precincts; architectural treatments will be required to break up the building form, and apartment standards will require a massing strategy that allows for adequate light penetration. What is still unclear is the cost to government or the sale arrangements to a private developer to demolish the public housing, construct new social housing, and to construct private housing – and the quantum of the latter. It is assumed (and there is certainly more than enough potential in the development plan to do so) that precincts 1 to 4 can comfortably accommodate 123 new social housing units, and while the stated capacity for 207 private units has been disclosed by the planning panel overseeing the scrutiny of the plans, it will be the contractual arrangements between the department of housing and the winning tenderer that will contain the details. The Greens will be monitoring the situation and will continue to look for opportunities inside and outside of Parliament to increase public housing and stop the sell off of public land. We’ll also champion the rights of existing public housing tenants who have been kept in the dark about much of the proposed change. Current arrangements are creating massive uncertainty among existing tenants, as The Age reported this weekend.